Tensions spilled over in a St. Louis suburb where an unarmed black teen was fatally shot by police this weekend, with riots and looting erupting overnight. Gunshots were heard and tear gas used late Sunday and early Monday, according to NBC station KSDK, as police called in back-up from surrounding areas and attempted to prevent the situation from spiraling out of control. Overnight, St. Louis County Police said, 32 people were arrested in connection with looting at 12 stores — including one which was nearly burned to the ground. Some 300 officers from 19 jurisdictions responded to the mayhem, and two officers suffered minor injuries, officials said. One officer was hit by a brick and another suffered a knee injury, according to KSDK. Michael Brown, 18, was shot “more than just a couple of times” by an officer in Ferguson, Missouri, on Saturday, according to county police. St. Louis County Police Chief Jon Belmar said the fatal shooting occurred following a “physical confrontation” that started inside a police car and spilled onto the street. The incident triggered protests featuring chants of “kill the police” as well as calls from the local NAACP for an FBI investigation. Brown’s killing immediately drew comparisons to the death of Florida teen Trayvon Martin, who was fatally shot in 2012 by a local neighborhood watch member and whose case sparked a fiery debate about race relations. Ahead of a planned statement from the family on Monday, the Brown family hired the same civil-rights attorney, Benjamin Crump, who represented Martin’s family. 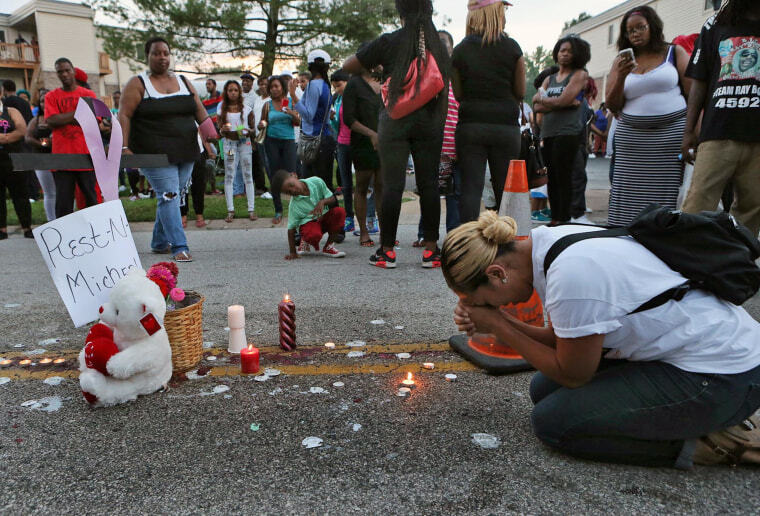 KSDK reported that looting broke out following a vigil for Brown on Sunday night. Police deployed tear gas in one incident, according to KSDK, while one of the its correspondents reported hearing gunfire. TV footage showed crowds kicking police cars and looters breaking into businesses ranging from convenience stores to cellphone shops, liquor stores to sportswear retailers. St. Louis County Police Department is in charge of the investigation. County Executive Charlie Dooley has said he'll request an FBI investigation. The officer who shot Brown has been placed on paid administrative leave. Shortly before dawn on Monday, some of the extra police deployed in Ferguson pulled back — but it was unclear for how long.